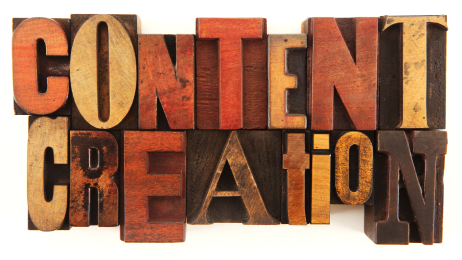 Are you looking to create content that engages? Does your content connect with people and encourage them to engage? In this article I’ll show you 26 ways to make content that engages people, in an A-Z guide of tips. Written content doesn’t exist without authors, whether constructing 140-character posts or 1000-word articles. Not only do you want people who can write well (e.g., clear points, proper spelling and grammar, active voice), you need writers and team members who can think strategically about the content that will resonate most with your audience. 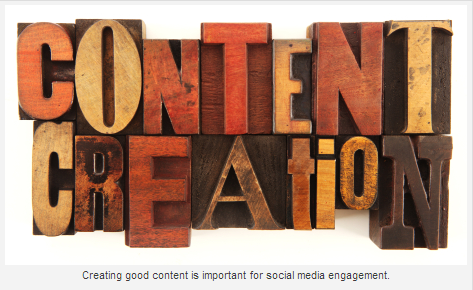 Creating good content is important for social media engagement. We’ll talk about more specifics as we go down the list. For now, think strategy. A blog provides an opportunity to discuss a topic in-depth. It’s a place where you canoffer explanations and suggestions, demonstrate how-to’s, show thought leadership and generously offer useful content for readers. Analyze your competitors (topics, frequency of posts, who writes them, how they are shared) to see what works and what doesn’t. Make your content valuable and unique. Subscribe to top industry blogs using RSS to keep track of the latest hot topics. Search for people asking questions about your keyword or phrase on Twitter. Ask your sales and support team what questions are asked most frequently by potential or current customers. Is your blog’s content meeting your customers’ needs and expectations? In the past couple of years, content curation has become more mainstream as businesses of all sizes and industries have started to adopt the practice. Brian Carter offered his social media posting rule at Social Media Marketing World (SMMW13): Post curated content 50%, original content 30% and promotional material 20% of the time. How are you using social data? Where can you improve your processes? 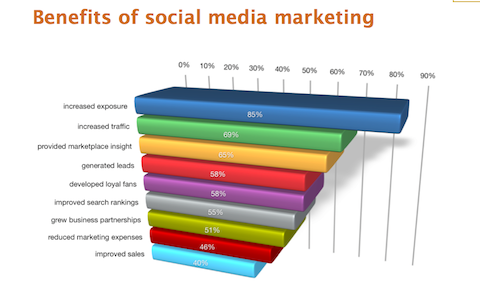 Source: Social Media Marketing Industry Report. Do you think of email and social media as separate entities? Do you favor one more than the other? The fact is, email and social media complement each other quite well. They leverage one another. Help the other to be seen by an audience that may not have otherwise come across the message. The act of setting up a Facebook Page and publishing it for the world to see doesn’t automatically send people running to engage with your business. Engagement strategies should be tried and tested over a period of time. Mari Smith’s “peeps” won’t hesitate to share content they like. Whether you’re a fan of Google+ or not, you should know that it’s a force to be reckoned with. GlobalWebIndex recently reported that Google+ remains the number 2 social network in the world with 359 million monthly active users (Facebook at number 1 with 903 million accounts). 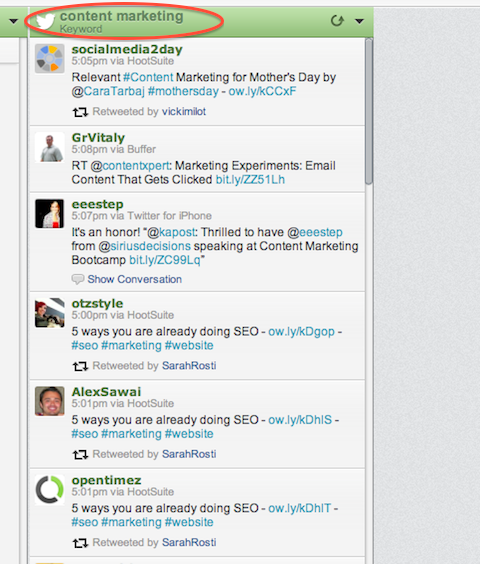 Use HootSuite to keep your eye on a keyword phrase. 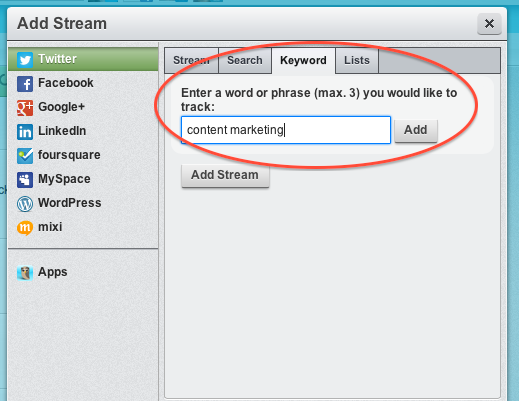 By monitoring the keyword phrase “content marketing,” you can see real-time results. The information you’re able to glean from customers and prospects will provide in-the-moment and future opportunities for engagement. 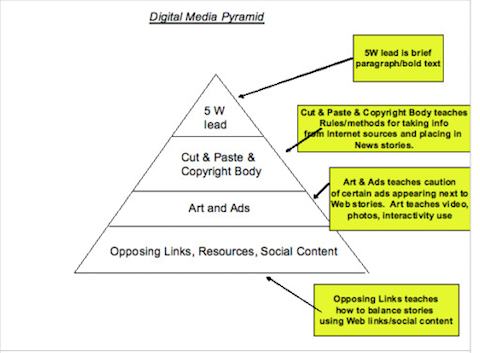 Digital media pyramid offers online reporters a valuable framework. It’s during this “self-education” when engagement is ripe. As readers click on links, businesses can remind them via social sharing buttons and invitations to like, retweet, +1, mention and share the content on multiple channels. And voilà, before you know it, there’s a whole lot of opportunity for engagement. 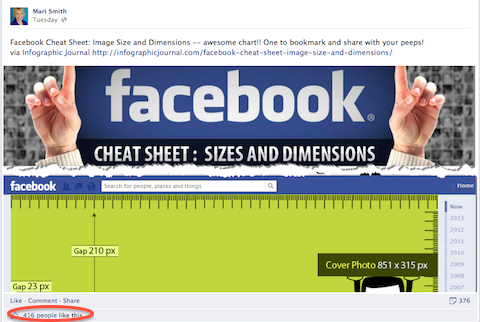 What would help get your content in front of the people who would most appreciate reading it? Keywords, plain and simple. Leverage LinkedIn Groups to find engaging content for company followers. Post status updates often (especially every morning). Add pictures, files, questions, links and contests in status updates. 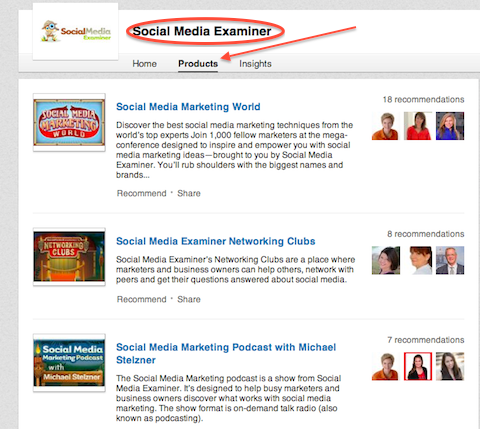 Promote your LinkedIn Company Page badge and product recommendations on your website. Social Media Examiner provides regular updates on LinkedIn and maintains their product offerings utilizing the vast resources of LinkedIn for companies. “In general, smartphone users look for local information while they’re on the go. In survey after survey, smartphone users want to know if a close physical location is open. Content for these types of searches shouldinclude basic contact information—address, phone number and operating hours—as well as a short description of the location highlighting why a visitor should choose that location. And for other types of businesses, Ian Cleary offers suggestions for how to create a blog that is mobile-friendly and a website that is responsively designed. 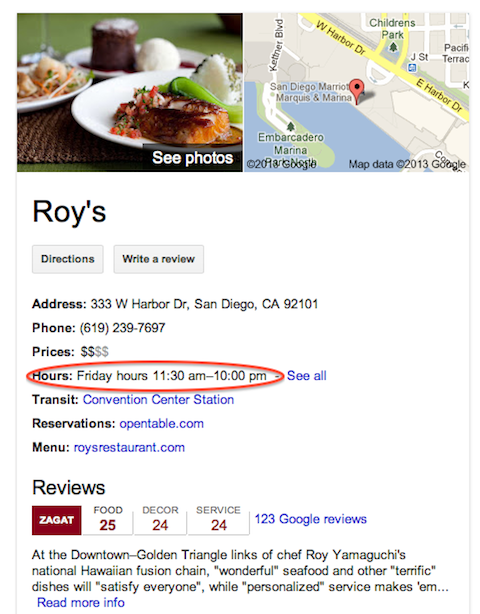 Opt to show your business hours since that’s what mobile users may want to know most. For instance, a search made on a Friday will show Friday’s hours. Some businesses are looking in all the wrong places. They’ll tell you they’re not seeing any return on their social media efforts and then you find that no one has responded to the comments or questions a user left. Timely and relevant content sounds like a good mantra! 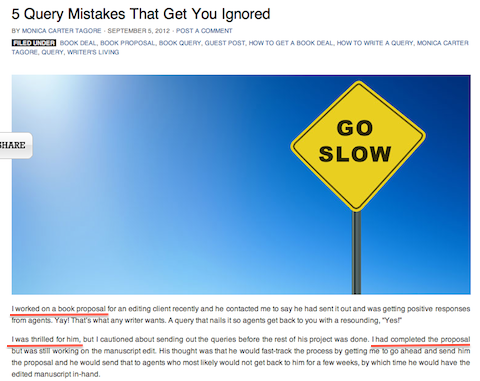 What are your thoughts about Quora for engagement pre- and post-content development? Storytelling has become one of the buzzwords we hear discussed in social media circles. Some interpret it to mean that the writer has to be able to tell a good story. And while that’s true, there’s something even more powerful about storytelling. Monica Carter Tagore makes it a practice to share parts of her personal story with readers. In many companies, social media community managers monitor the business’ social profiles for company mentions and to share relevant content with their Twitterfollowers. And while they’re doing a terrific job at it, customers often want to know what CEOs and upper management are thinking, reading and doing in the industry. Why does it seem at times that other businesses have more unique content available to them? The truth of the matter is that they started where you did—without content or maybe with a few old white papers lying around. What is it about a video that captures viewers? For one thing, if done well it has a way of grabbing our attention, educating and entertaining at the same time. We’re taking in a lot of written content all day long. A video offers a few minutes of respite. We’ll talk more about video content in #25, YouTube Videos That Engage. Webinars, the unique blend of using online experiences for training seminars, have become so mainstream that I can hardly remember the first one I attended or how long ago. The ability to sit at your desk and tune into a training session conducted in another part of the country, or world for that matter, and be exposed to real-time content may be one of the most rewarding experiences that a business can bring to their target audience. Get the PowerPoint presentation from the speakers two weeks in advance to give yourself a chance to review it and ask for a revision if needed. Have a speaker prep session one week in advance, in which the speakers will rehearse their presentation. From Infographic, World Wide Webinars, by ClickMeeting. 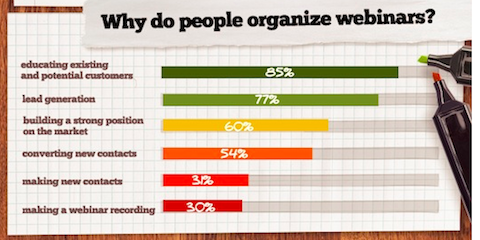 In the image above from World Wide Webinars by ClickMeeting, you can see why people organize webinars. Nordstrom has been recognized for their customer service excellence. People care about their experiences with businesses—and that goes for online content, too. They’ll be more likely to notice when something isn’t working well, such as a poor navigation scheme, broken links and run-of-the-mill content. Bottom line, online users expect things to go well. Social media is a local, national and global experience and knowing good times to post is critical. 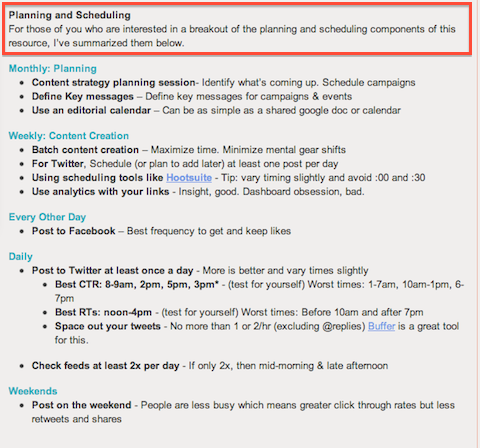 He also offers a helpful plan and schedule for good times to post content, with translations in eight languages. Knowing when and where to post makes social media engagement more doable. As you can see, there are many elements that go into engagement. Everything from A-Z, beginning with author and ending on time zones. And we could discuss much more. Now it’s your turn.